Does the Newtown Historic Association accept unsolicited donations of artifacts or historic materials? Yes. 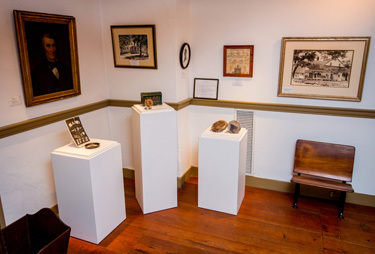 The Newtown Historic Association accepts bequests and donations of artifacts when the items support the existing collections and the mission of the Organization. Items must be related to “NEWTOWN”. As not all historic items assist in the Half Moon Inn displays for interpretation, nor the archives, the Newtown Historic Association reserves the right to reject, prior to receipt, or dispose after receipt, any items or materials deemed inappropriate for the NHA Collections. Who should I contact to make a donation? Please contact the Newtown Historic Association’s Honorary Life Director, David Callahan at 215.968.4004 or email info@newtownhistoric.org to schedule an appointment to discuss your potential gift. Please do not drop-off or send items without first contacting the Newtown Historic Association. Your potential gift should be handled appropriately, and we want to ensure that it is identified and acknowledged. Artifact and historic material donations may be tax deductible for tax purposes. You should consult your tax advisor for additional information. If you are planning a tax deduction, the item or materials must be appraised at the donor’s expense before delivery to the Newtown Historic Association. For tax reasons, the appraisal is the responsibility of the donor, the amount of the donation is filed by you for tax purposes and the Newtown Historic Association does not see the appraisal amount. What happens to my artifact or historic material after it is offered to the Newtown Historic Association? – When donating items, please provide as much information as possible about them. If possible, send photographs of the items for consideration. – If your item is accepted, you will receive a Deed of Gift form which transfers legal title of the gift to the Newtown Historic Association. – All donated artifacts and historic materials are documented and cataloged in the Newtown Historic Associations database and archives. How will my artifact be used? Your item may be used in a permanent display at the Half Moon Inn or as part of a special exhibit. Due to limited space, displaying every item is not possible and we cannot guarantee that any artifact or historic material will be displayed. However, while your item may not be exhibited, it will be available to researchers.